Great News, Meat is Going to Kill You! To be honest, this story didn’t cause me any concern. In fact it made me happy. I’ll explain why later. The reason the story didn’t phase me at all is because I understand that the real cause of heart disease is most likely inflammation caused by a neolithic food (veggie oils, excessive fructose) and not something mammals have been eating since the dawn of time (see Paleo 2.0 by Dr Kurt Harris). Pop nutrition scare stories don’t work on me anymore. For a while I was evangelical when it came to nutrition. Not anymore. If someone asks me, I will happily share my nutritional journey, but I’ve quit wasting my energy on the non-receptiveness masses. Several months ago I reached out to a very good friend with a well researched email connecting her health problems to gluten. The symptoms were classic. Instead of a thank you or a follow up discussion, I got unfriended on Facebook. Oh well, lesson learned. I’m not going to lose anymore time trying to help people who aren’t receptive. Even the people who are the closest to me. My blog is here for those that care to hear about what worked for me. So if someone tells me that meat will give me cancer, I’ll respond by saying “Maybe, you’re right“. This story that upset so many Paleo folks is actually excellent news. Next week and maybe a little longer the scared sheeple will buy less red meat for fear they will drop dead from cancer or a heart attack. 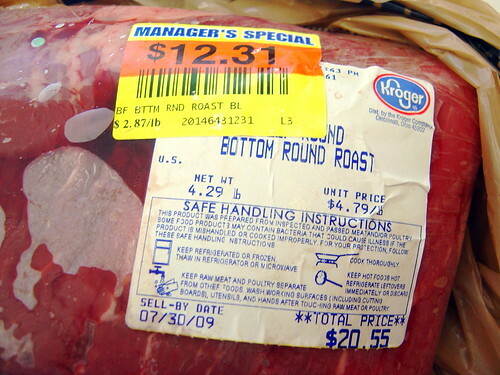 This means grocery stores will have an excess supply of beef and lamb. To prevent loss, they will mark down the price. While the doped masses are buying tofu and Low-Fat Graham Crackers next week, I’ll be stocking my freezer full of discount lamb. Before I get a question about conventional versus grass pastured meat, let me say that I strongly prefer grass pastured, but if the price is right I will get lean cuts of conventional beef or lamb. For ground beef I will only buy 100% grass pastured. excellent point regarding the prices that i did not consider. my wife always bargain shops for brisket after st. patties. keep an eye out. also, yet more facebook drama….i will not go off on that tangent. I can see myself in article. I also stopped losing my time and effort. And continue eat red meat everyday :). Very good blog !